Winner High School volleyball team placed 8th at the Eastern Classic in Milbank on Saturday. Winner lost to Tea Area in three sets—23-25, 25-28 and 17-25. Winner lost to Tri Valley in 3 sets 26-28, 25-17 21-25. Winner lost to Sisseton 16-25, 25-22, 19-25. 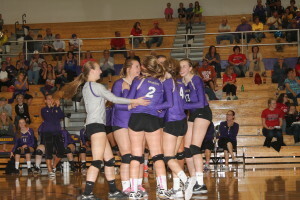 “We played very inconsistent and had a lot of ups and downs,” said coach Jaime Keiser. “We would play good one minute and then everything would fall apart the next. We had a lot of passing and attack errors which gave our opponents too many unearned points,” said the coach. The next action for Winner will be Oct. 29 at Mobridge and Oct. 4 they will be at Gregory.